I love reading why hospitals ban VBAC. There are opportunities to learn about how that particular hospital operates, specific insurance issues they face, internal politics, and personal philosophies. And it’s always interesting to see things from the OBs perspective. It’s very telling that when they offered VBAC, only 2 women per year opted for VBAC after being “counseled by a physician.” Most women who have been “counseled by a physician” on VBAC vs repeat CS can tell you how that conversation goes. It typically leaves the woman with the impression that VBACs are dangerous and repeat cesareans are not. 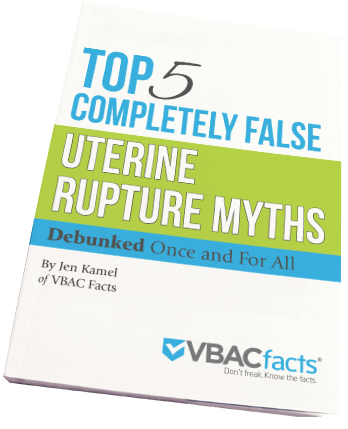 Women are lead to believe that if you VBAC, you are putting yourself and your baby at risk, and if you have a repeat cesarean, you and your baby will be fine. Since their VBAC ban, they “recommend a repeat cesarean delivery and tell patients of our policy. We occasionally have a patient that refuses a recommended c/s (breech, previous c/s, macrosomia, history of shoulder dystocia with permanent injury) and we have them sign a consent form and take care of her very well. This is all well within the standard of care.” I wonder how much that “occasional” patient must fight in order to have a VBAC. If it’s like most hospitals, very hard. “On a similar topic, we don’t offer women elective primary cesarean delivery even if the patient should decide this is her preferred method of delivery. In this case, we do refuse to allow women to give birth the way they choose.” I would hope that if I came in and asked them to remove one of my lungs, without any medical reason, they should deny me as well. Should they be congratulated for not performing major abdominal surgery without a valid medical reason? “None of the physicians in our department are concerned with our cesarean delivery rate. One quote I heard is, ‘My cesarean delivery rate is 100% for everyone who needs a cesarean delivery. '” And everyone who has had a prior cesarean “needs” another one, right? Be sure to read the two responses to this piece supporting VBAC and denouncing this VBAC ban. The first by two MDs and the second by a CNM. 1) Our anesthesia department refuses to participate in a management plan to facilitate VBAC despite any data we may present. If we request them to be in house during a VBAC, they will refuse. Then I have to document in the chart that I requested anesthesia and they would not come in. That is a terrible way to do business. Our anesthesia department does provide excellent care to our laboring patients and are pros at emergent cesarean deliveries. They are skilled professionals, but the department is not staffed well enough to provide a CRNA or anesthesiologist dedicated solely to L&D. 2) Even though our Med Staff Rules and Regulations require on call personnel to able to present themselves within 20 minutes, this is not reliable. Also, we have only one OR crew and only one anesthesia person available in the evening. We have a protocol for an emergency c/s when the OR crew is already operating, but nothing is workable to do a cesarean hysterectomy with no anesthesia or OR crew. If you have ever done an emergent c/s under local with a CNM and an L&D nurse, you will appreciate this. 4) In order for us to offer TOLAC, all 6 of our Ob/Gyn’s need to be on board with the plan and they are not, mainly because anesthesia is not in house. There is data that supports VBAC without anesthesia present in the hospital, but you don’t know our anesthesia department or how busy we are in the evenings. 5) Unfortunately, the national data on c/s rates is usually 2-3 years behind, and our hospital has matched those rates. We deliver about 975 babies per year, and our c/s rate to date for CY 2007 is 37%. Should we be ashamed of the number or proud of the good outcomes? The balance between risks and benefits in this regard in tenuous. 7) We can’t and don’t force women to have repeat cesarean deliveries, for that would be assault. We do recommend a repeat cesarean delivery and tell patients of our policy. We occasionally have a patient that refuses a recommended c/s (breech, previous c/s, macrosomia, history of shoulder dystocia with permanent injury) and we have them sign a consent form and take care of her very well. This is all well within the standard of care. On a similar topic, we don’t offer women elective primary cesarean delivery even if the patient should decide this is her preferred method of delivery. In this case, we do refuse to allow women to give birth the way they choose. 8) When we did offer TOLAC, we had about 2 per year. We take this to mean that the others, after being counseled by a physician, opted for repeat c/s. Considering this, our c/s rate would not appreciably change if we offered VBACs. 9) Please don’t condemn us for a policy that does not recommend VBAC’s. Recognize that the data and ACOG support both options, and also recognize that the data has to be applied to the hospital. Because of the number of deliveries we perform, we have reliable data on post-operative infections (half the national average), TTN, transfusions, IUFD’s, etc. Also know that we have excellent collaboration between our 6 physicians, 7 midwives, and 1 nurse practitioner. We don’t make policies like this lightly and we examine the data carefully and applied it to our current practice. Seems to me that a mother with a hole in her abdomen, who can not function normally for weeks, is not healthy. is caused to be crippled in motherhood. Some women/babies overcome this quickly, some do not. I am sure that very soon, when women awaken and realize what has been stolen from them, this will be considered the ‘dark ages’ of birth. What is being stolen so carelessly is as intangible, and only a mother would know what they lost when they have it back. Wow, that is interesting, especially because they cite as one of their reasons: “Even though our Med Staff Rules and Regulations require on call personnel to able to present themselves within 20 minutes, this is not reliable. Also, we have only one OR crew and only one anesthesia person available in the evening.” In a wonderful VBAC book I read recently, the author (who is also an Obstetrician himself) said that ANY hospital that claims that they are “not equipped” to handle VBACs that may result in cesareans should NOT be doing ANY cesareans at all. His logic is that if you are not equipped to handle VBACs, you are also not equipped to handle first-time emergency cesareans, which require the same necessity of speed when they are truly warranted. Therefore, this is one argument that no hospital should be able to make. If this is truly the setup at this hospital, they should not be doing any cesarean deliveries at all.